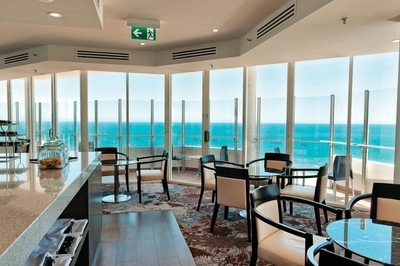 Newly refurbished, the Rendezvous Grand Hotel in Scarborough offers some pretty spectacular views. Image courtesy of TFE Hotels. The Rendezvous Grand Scarborough has recently undergone a transformation giving it a fresh new look and some added extras. This beachfront property offers great views of both the sea and some amazing sunsets. Ideal for business travelers, the property now offers a club lounge on the 25th floor. 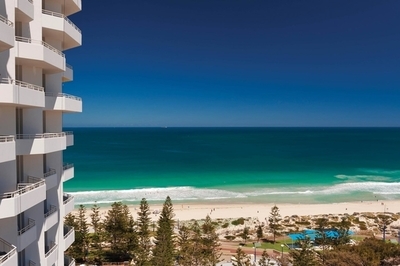 Exclusively available for guests staying in the premium club rooms and suites and offering spectacular views across Perth's coastline, this is the best place to get a bit of work done, grab a bite to eat and relax. Particularly if you're travelling alone, the Club Lounge is the perfect place to not stand out as a solo business traveller. New dining venues include Straits Cafe, serving modern Australian cuisine also with ocean views, and the Lobby Bar, a lounge style venue with tapas and a decent sized wine and cocktail menu. Located on level 25, the new club lounge is a great place for a business traveler to do a bit of work, hold a meeting or have a solo bite to eat. 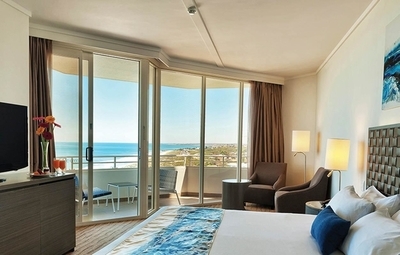 Image courtesy of TFE Hotels. 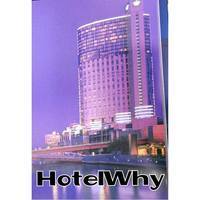 The hotel is located about 30 minutes drive from the airport and is a quick 15 minutes from Perth's CBD.